We all know how important sleep is. A good nights sleep helps our body function at it’s optimum. You think better, physically perform better and feel better overall. Without a good nights sleep your body does not recover from the days activities. Most Australians sleep for between 7 and 8 hours at night. Motor vehicle accidents and work place accidents have been linked to poor or not enough sleep. Heart attack, stroke, type 2 diabetes and increased blood pressure have also been linked to poor or not enough sleep. Did you know that the Chernobyl nuclear meltdown of 1986 which occurred in the Ukraine was linked to lack of sleep and tiredness in workers. There are many causes of poor sleep. It could be something simple like having too much caffeine, nicotine and alcohol as these are all stimulants and will keep you awake. Sleeping in or having naps during the day will also keep you awake at night. Or it could be excessive snoring/sleep apnea. It is when your airway collapses during sleep and prevents air from getting to your lungs. You stop breathing momentarily, which causes sleep disturbances and puts a strain on your heart. You wake up gasping, breathe again and go back to sleep. This is then repeated throughout the night. So it is a never ending cycle of falling asleep, airway gets blocked, you wake up, airway opens up and you breathe, fall back to sleep until the next blockage of the airway. So you wake up tired and not refreshed. You may not realise that you suffer from sleep apnea as your body gets used to the interrupted sleep pattern. If you think this is happening to you go and have a sleep test done. This is the only way of really knowing whether you are suffering from sleep apnea. Talk to your doctor about it and they can organise a sleep study for you or we can even organise one for you. A lot of people who snore also suffer from sleep apnea. Loud snoring obviously affects relationships. Some couples end up sleeping in different rooms because of the snoring. 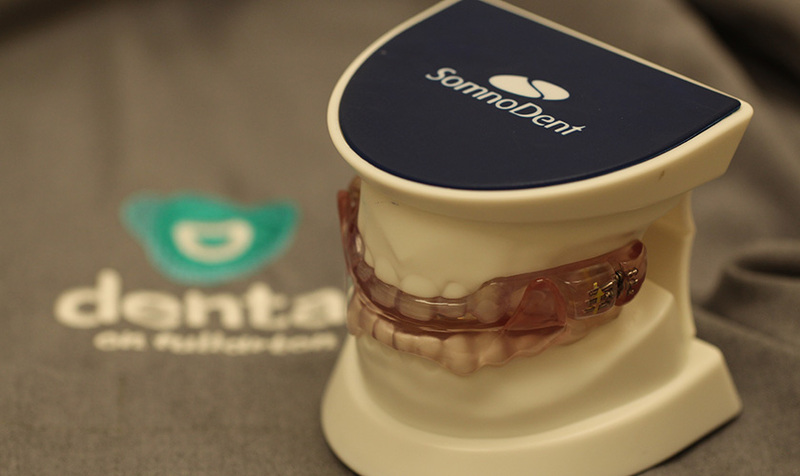 A simple device known as a Mandibular Advancement Splint gets rid of or greatly reduces the snoring and eliminates or reduces the sleep apnea. Dentists who are trained in dental sleep medicine can make one of these for you. I have been making them for over 10 years and can confidently say they work and have changed peoples lives. Let me know if you think you suffer from sleep apnea or excessive snoring and maybe a Mandibular Advancement Splint can help you.